Still, I wanted to find a way to something creative while at home – so I tapped into one of my older creative pursuits: drawing. I used to draw quite a bit when I was younger; I even took an art class on cartooning when I was about 13 or so. I used to spend a lot of time trying to sketch characters I developed or replicating baseball team logos that caught my eye. I’m not sure I was ever very good, but that’s really not the point. I liked it. And I recently discovered I still like it thanks to my wife Kim and my friend Steve. Kim started colouring complex colouring books a while back and I realized that she was really onto something not over complicating her artistic endeavours – she didn’t wait for the right conditions or the time. She just sat down and created something. Steve on the other hand embarked on the #100daysproject, where he did something creative every day for 100 days. This was my favourite of his. I started with a rough sketch in a notebook, but it wasn’t until I sat down with our oldest son to draw together that I really found enjoyment in it. The kids inadvertently destroyed that sketch by “adding to it” with some markers. 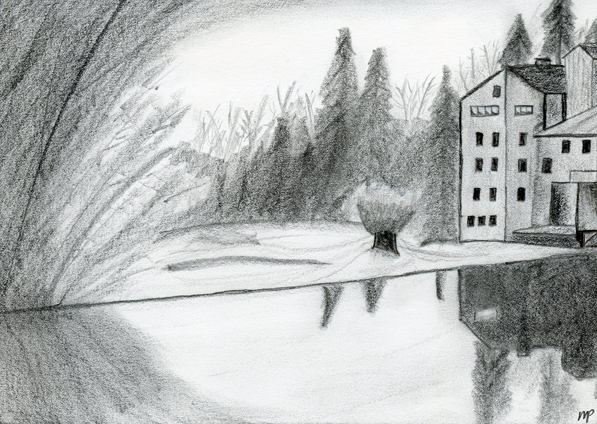 But we sat down again a little while later and I made this sketch based on a photo I took last fall. I was pretty happy with the result, so I soon embarked on another effort, this time based off of a photo my friend Wayne Simpson took of the Elora Mill. 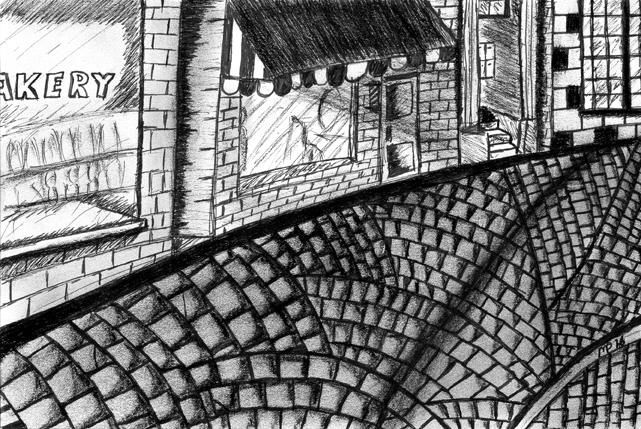 More recently I did this one, which was a pen sketch, that I went over with charcoal afterward. This wasn’t based on an existing photo, and while I need to work on perspective, I was quite happy with the results. 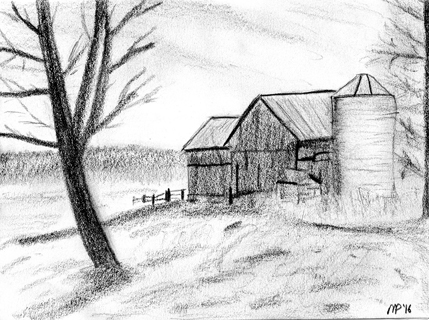 This entry was posted in Details, Sketches and tagged art, drawing, Elora, farm, mill, sketch, sketching, streetscape, trees. Bookmark the permalink.